PAIiIZ and Ministry of Development open the doors for Polish business in Kazakhstan by presenting the potential of Polish companies during the 9th Astana Economic Forum. Kazakhstan is increasingly popular for foreign companies as next year it will host the EXPO2017 World Exhibition in Astana. Poland has just announced the access to this prestigious event. For the European Union, Kazakhstan is the top important business partner from Central Asia regarding investments and trade. EU-Kazakhstan Enhanced Partnership and Cooperation Agreement was signed in January 2015. It is worth to stress that Kazakhstan is the first country of the Central Asia region that signed such memorandum. Also for the Polish government Kazakhstan is one of the most significant economic partners. The country has been added to the list of the five top important business destinations for Polish companies and it was covered by three promotion programmes facilitating trade exchange and investments of such sectors as: construction, machinery, mining and defence. Therefore, the governmental mission of Polish business to Astana was expected to shape the bilateral cooperation for a long time and open the doors wider for Polish business not only in Kazakhstan but also in the whole Central Asia Region. Among the highlights of the mission of Polish delegation to Kazakhstan there were: signing the participation agreement in EXPO 2017 Astana Wold Exhibition by Poland as well as the meeting of Polish deputy minister of economy Radosław Domagalski and Deputy Minister of National Economy of Kazakhstan Timur Zhaksylykov. On the same day, a B2B session for Polish and Kazakh companies has been arranged. During the event, a business agreement was signed by Polish green energy company Airon with Kaznex Invest. This is the next step of stronger investment presence of Polish companies in this country. It has been estimated that there are about 200 Poland-based business operating in Kazakhstan that have already invested about 130m $ there. The majority of Polish companies doing business in this Asian country represent mining sector as Petrolinvest, Poszukiwania Nafty i Gazu - Kraków or Drill-Lab Kazachstan. Among other active Polish players there are construction and pharmacy companies as Polpharma and Polfa. The broad range of Polish offer was presented during 9th Astana Economic Forum at the Polish national stand. Among ten Polish companies that went on the mission and took part in the forum there were: AIRON Green Energy Turbines, Krajowa Spółka Cukrowa, URSUS, Małopolski Rynek Hurtowy, Trustee and Ekolog. 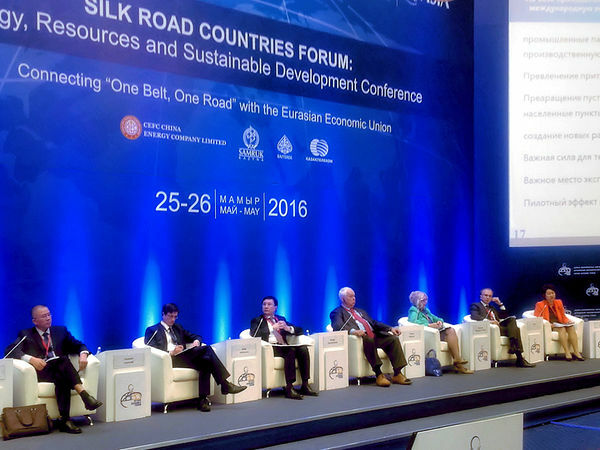 The Polish governmental delegation also joined The Silk Road Countries Forum: Energy, Resources and Sustainable Development Conference to talk about Chinese multinational project One Belt One Road (OBOR), that will lead along Poland, from China to the Western Europe.